The grebes are an ancient family going back 80 million years, well-represented in the fossil record, and not closely related to any other birds (Llimona & del Hoyo 1992). They are adapted for diving, with legs set well back on the body and toes lobed. They spend virtually all their time in the water and are very ungainly on land, even when just turning eggs at an anchored nest of floating vegetation. 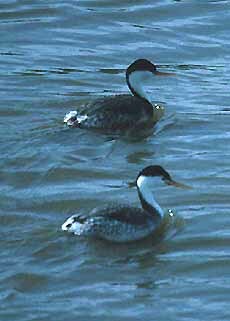 The highly migratory northern hemisphere species, like the Horned Grebe (left), are brightly feathered in summer but become plain dark-and-white in winter. 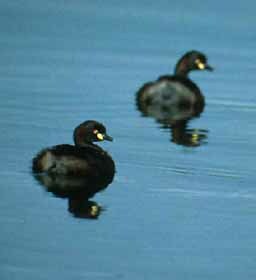 More sedentary birds, such as the Pied-billed Grebe (below), wear more similar plumages throughout the year. Even this common and widespread North American species has not been studied systematically (Muller & Storer 1999). I consider them great little birds, equally enchanting for their loud cackling calls when hidden in the reeds, and their habitat of sinking slowly under the surface like a submarine retreating from periscope depth. Although there are five genera in the grebes, each is basically a variation on the same theme, and it is always easy to tell that a grebe is a grebe. Most of the world's grebes are widespread in range, which is likely why I've already seen 80% of them. However, the Hooded Grebe Podiceps gallardoi of southern Argentina, which I've not seen, was not described to science until 1974. I do not include among the world's 20 species the two which have gone extinct in the last half-decade: the huge flightless P. gigus of Lake Atitlan, Guatemala, and P. andinus of the Colombian Andes. One other species -- the Alaotra Grebe Tachybaptus rufolavatus -- is restricted to a single lake in northern Madagascar, and now almost extinct. The North American grebes of the genus Aechmophorus are an interesting study in the biological species concept. Considered a single species "Western Grebe" for over a hundred years, recent study [e.g., Ratti 1979, Nuechterlein 1981, Storer & Nuechterlein 1992] showed that the two types mated assortatively. Thus the Western Grebe (left, upper bird) and the Clark's Grebe (left, lower bird) are behaving as different species. Here where I live in Monterey County, California, there is a huge reservoir (Lake San Antonio) at which both species nest when water conditions are right. Although there are hundreds of pairs of each type nesting next to each other, I have yet to observe a mixed pair. Apparently it is differences in mating calls and in their "dances" (when pairs dramatically spin across the water elevated on their fast-paddling feet) that keeps them separate. The rest of the year they frequent coastal bays and estuaries and often sit side-by-side. Clark's is the one with more white in the plumage (up around the eye, on the flanks and neck) and a brighter orangier-yellow bill, but there remain some birds that appear intermediate (see Eckert 1995). Tropical grebes tend to be small and dark, from the Australasian Little Grebe of Australia & New Guinea (below left) to the Least Grebe of the American neotropics (below right). Greg W. Lasley took the latter shot of a pair of Least Grebes copulating in south Texas -- it is one of my favorite photos to view. Not only is the action hot & heavy, but the reflection below the nest is superb (look for my attempts at capturing reflections on other shots on this page). 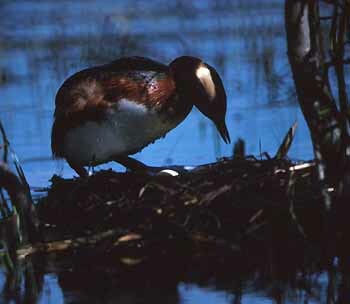 Photos: The Horned Grebe Podiceps auritus was turning eggs on her nest at Churchill, Manitoba, Canada, in July 1988. 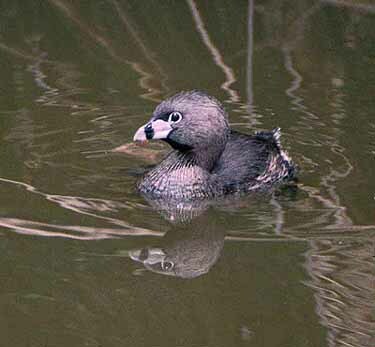 The adult Pied-billed GrebePodilymbus podiceps was at Roberts Lake, Seaside, Monterey Co., California, on 15 June 1999. The Clark's Aechmophorus clarkii (front) and Western A. occidentalisgrebes were in Moss Landing harbor, Monterey Co., on 5 Apr 1991. The Australasian Little GrebesTachybaptus novaehollandiae were at the Port Moresby sewage ponds, Papua New Guinea, on 14 Oct 1983. 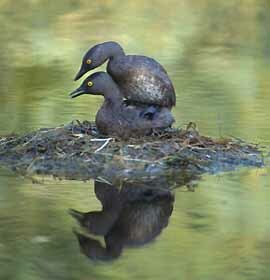 Greg Lasley photographed the copulating Least Grebes Tachybaptus dominicus on their nest near Linn, Hidalgo Co., Texas, on 30 July 1995. All photos © D. Roberson, except the Least Grebe photo © Greg W. Lasley. All rights reserved. There is no "family book" per se of which I'm aware (there are numerous coffee-table "survey" books that include grebes among other water birds), but an excellent introduction to the family (with great photos) is Llimona & del Hoyo (1992). Eckert, K. R. 1995. Photo note: Western and Clark's Grebes. Birding 27: 54-55. Llimona, F., and J. del Hoyo. 1992. Family Podicipedidae (Grebes) in del Hoyo, J., Elliott, A., & Sargatal, J., eds. Handbook of the Birds of the World. Vol. 1. Lynx Edicions, Barcelona. Muller, M. J., and R. W. Storer. 1999. Pied-billed Grebe (Podilymbus podiceps) in The Birds of North America, No. 410 (A. Poole and F. Gill, eds.). The Birds of North American, Inc., Philadelphia, PA.
Nuechterlein, G. L. 1981. Courtship behavior and reproductive isolation between Western Grebe color morphs. Auk 98: 335-349. Ratti, J. T. 1979. Reproductive separation and isolating mechanisms between sympatric dark- and light-phase Western Grebes. Auk 96: 573-586. Storer, R. W. and G. L. Nuechterlein. 1992. Western and Clark's Grebe in The Birds of North America, No. 26 (A. Poole, P. Stettenheim, and F. Gill, eds.). Academy Natural Sci., Philadelphia, and Amer. Ornith. Union, Washington, D.C.